Summer in Gansbaai is known for its calm sea days and easterly winds bringing in the colder water temperatures. However, this summer we have had far more westerly winds which made the water much warmer and incredibly we have been reaching water temperatures of 22oC . 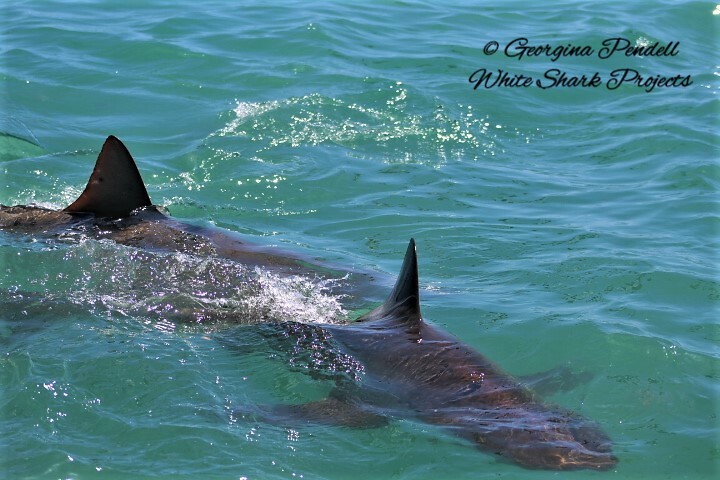 This warm temperature woke up a lot of Gansbaai’s special marine animals and the sea has been teeming with life. One of the most magnificent creatures White Shark Projects have been observing from our cage diving vessel, Shark Team, is the bronze whaler shark. 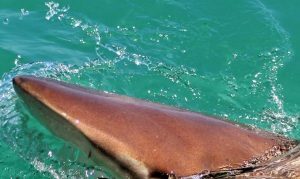 Bronze whaler sharks, also known as a copper sharks and fondly known to us as “bronzies”, is a species that likes warm temperate and tropical waters and can be found both inshore and offshore. They can be found inshore in the surf zone to far offshore, from the sea surface to 400 metres deep. 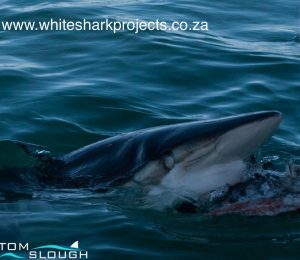 They are recognised by their narrow hook-shaped upper teeth, lack of a prominent ridge between the dorsal fins, and that beautiful bronze colour that shimmers in the sun. The bronze whaler shark can reach lengths of 3.3 metres and weigh around 300 kilograms. Bronzie reproduction is viviparous- meaning the eggs hatch inside the female and the pups are fed by a placenta. This means they give birth to live young and can have between 7 to 24 pups, with a gestation period of about 18 months. The pups grow slowly and only reach 7 foot in length when they are between 13 and 19 years of age. The average lifespan of a bronze whaler is about 25 – 30 years. Bronzies feed mostly on small bony fish, smaller sharks and squid. They like to hang out in a pack when hunting and the numbers are used to their advantage when encountering a bait-ball of sardines or a larger prey. These sharks perform seasonal migrations, in response to temperature/seasonal changes, reproductive events (males and females do not co-exist throughout the entire year), and prey availability, for example they are attracted to the annual sardine run. 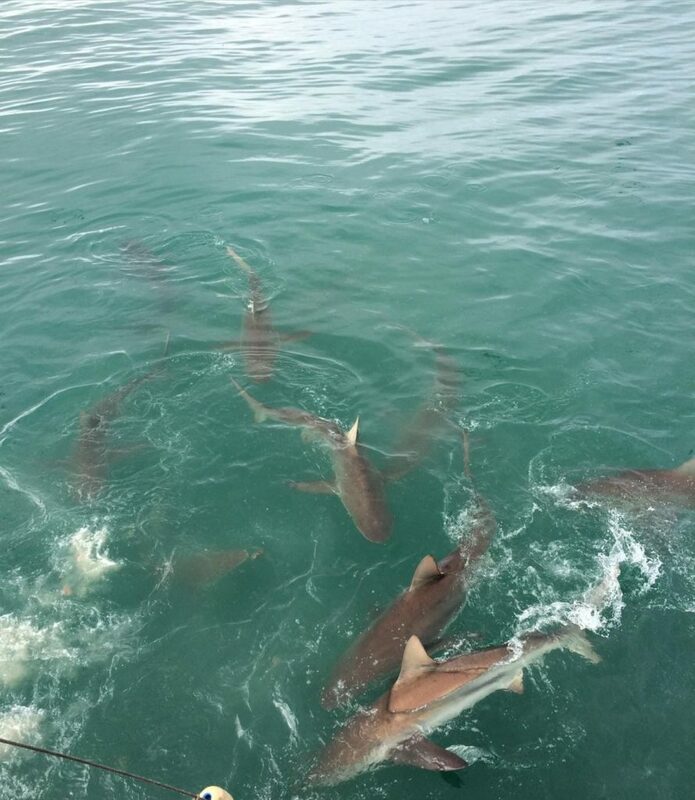 Bronzies also migrate to the inshore waters around Gansbaai during our spring/summer and it is always a pleasure to see these beautiful animals. We started seeing bronzies coming back into the bay around September 2018 and they have been getting increasingly more active. The water temperatures reaching a staggering 22oC has meant that the bronzies have been extremely active….a few have even tried a sneak attack on the bait line. Even more amazingly, the bronzies have been full on breaching out of the water and even doing a little spin in the air for us. This is a new behaviour that we have never witnessed before. So why are the bronzies breaching? They are trying to get rid of skin parasites – the impact of hitting the water may shake off some of those annoying parasitic copepods. Communication – could be a form of signalling to others or even some sort of courting performance. Predator avoidance – maybe when a bigger shark swims underneath the bronzie and startles it into jumping out of the way. We have noticed when taking observational data on bronzies that they have a lot of parasitic copepods so maybe the breaching bronzies are just trying to get the annoying parasites off of their skin. However, it is currently thought that the impact of a shark hitting the water is not enough to shake off pesky parasites. It could be a form of communication, predator avoidance or prey capture…However, we will never know for sure what goes on in the mysterious mind of a shark! You never know, they may just be jumping and twirling in the air because it is fun! One thing is for sure, the bronzies have been putting on quite a show for us this summer and it has been an absolute joy to witness from our cage diving vessel, Shark Team. These brilliant bronzies are definitely part of what makes Gansbaai’s marine ecosystem so special. 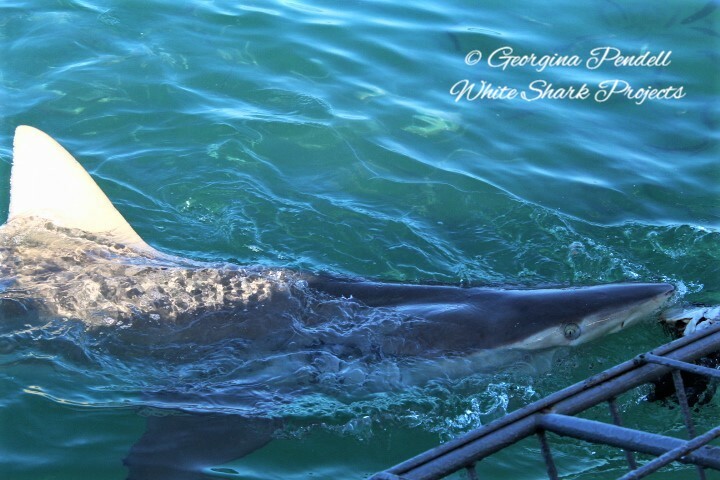 To experience the wonders of Gansbaai’s special marine ecosystem – contact our booking team!